By transforming the formerly beige home with a more modern deep-gray and red palette and glossy black trim, it recedes into the landscape. Not many home renovations start by removing a massive pipe organ from the living room, but then this was no ordinary house. 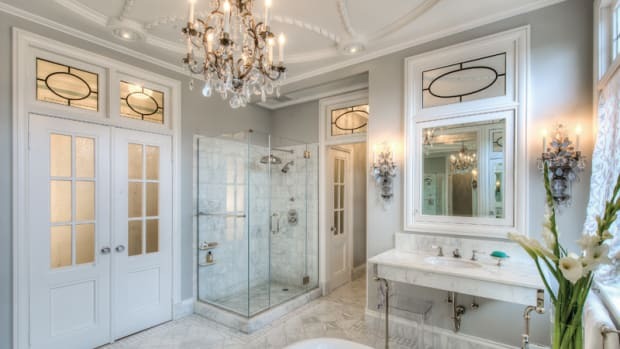 Built in the early 1900s as an entertaining venue down the hill from the family mansion in Summit, New Jersey, the bungalow was clearly meant for parties. “There was no front entrance,” explains the homeowner, “just an enormous transition space leading to an even bigger living room with a 20-foot vaulted ceiling.” According to legend, a hundred years ago operatic tenor Enrico Caruso found the acoustics to his liking, and other international guests included President Woodrow Wilson and Madame Chiang Kai-Shek. But as a place for a 21st-century family to live comfortably, it was nearly unimaginable. “No one could figure out what to do with it,” continues the homeowner. “But Tom made sense of it.” Tom is Thomas Kligerman, a partner at the architecture firm Ike Kligerman Barkley. 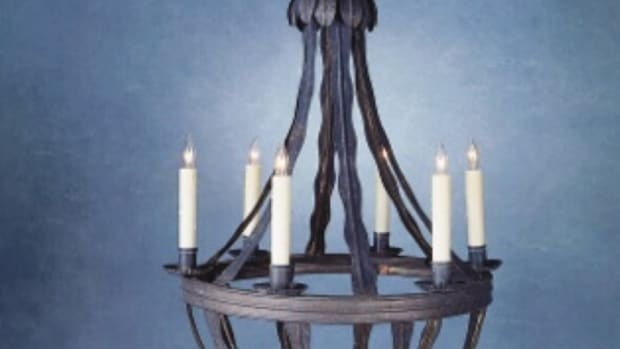 He is also a longtime friend of the homeowners, and he enjoyed many Thanksgivings with them in their former house, helping to prepare the feast. “Unlike most projects, where you spend a good amount of time upfront getting to know the clients, with this one I could hit the ground running,” he says. While the house called for a major demolition, among its assets was the site—a secluded acre-plus with formal gardens, albeit overgrown at the time. 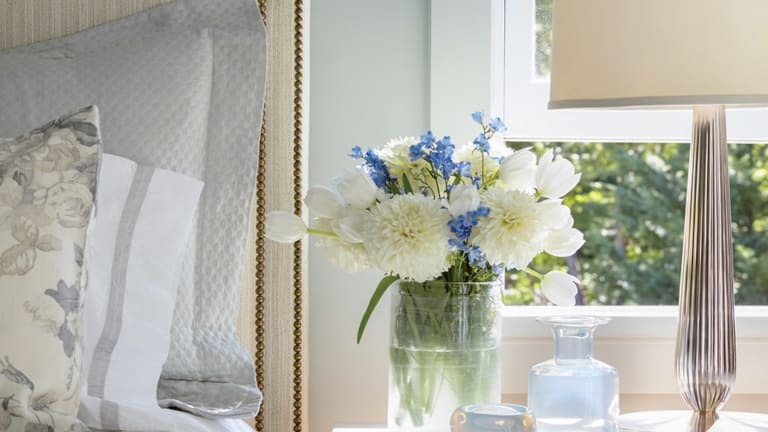 Coming from a 10-acre horse farm, the homeowners were delighted to find such privacy in a suburban setting. And Kligerman, along with IKB Director of Interiors Mia Jung, was up for the renovation challenges. “It is 85 percent a new house, on basically the same L-shaped footprint,” he explains. The IKB team reproportioned rooms, tore out the old kitchen and moved it to a newly built wing, installed radiant heated floors throughout, replaced pretentious faux stone mantelpieces with more modern materials like limestone, and favored reclaimed white oak paneling for much of the interior wall space. 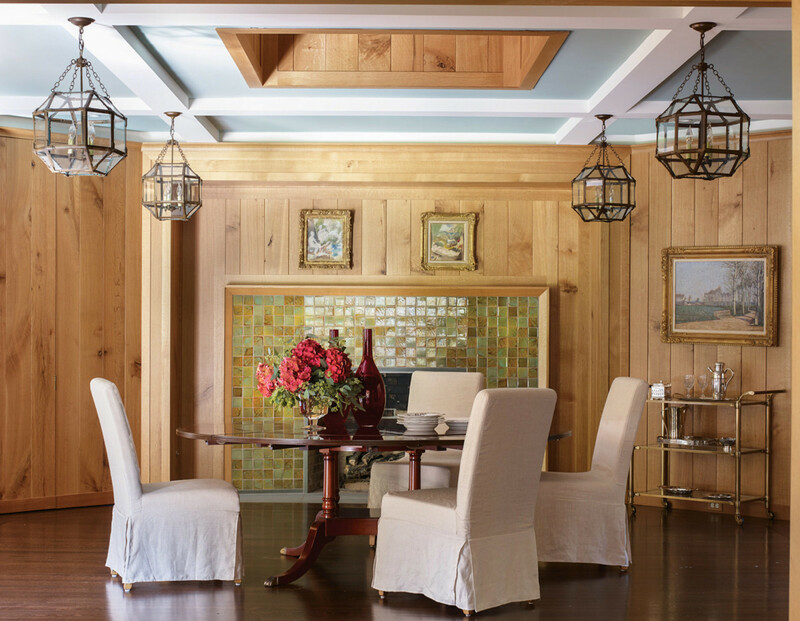 An octagonal transition space turned into a dining room with white oak rift quarter sawn paneling is the homeowners’ favorite room. 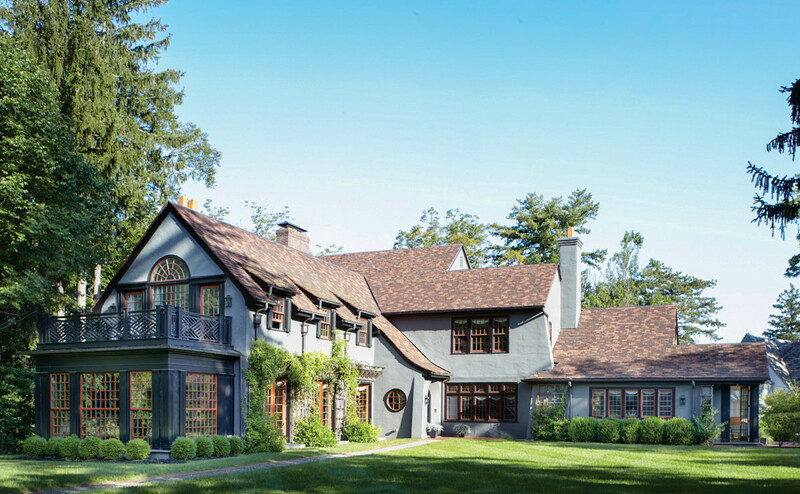 Painted an insipid, detail-obscuring beige on the exterior, the stucco house had a more redeeming red-and-black tile roof that reminded Kligerman of early English Arts & Crafts, and he cites 20th-century architects C.F.A. Voysey and Baillie Scott as inspirations. “I wanted something richer [than beige], with saturated landscape colors,” he says. By transforming the home with a more modern deep-gray and red palette and glossy black trim, it recedes into the landscape, just as the architect intended. 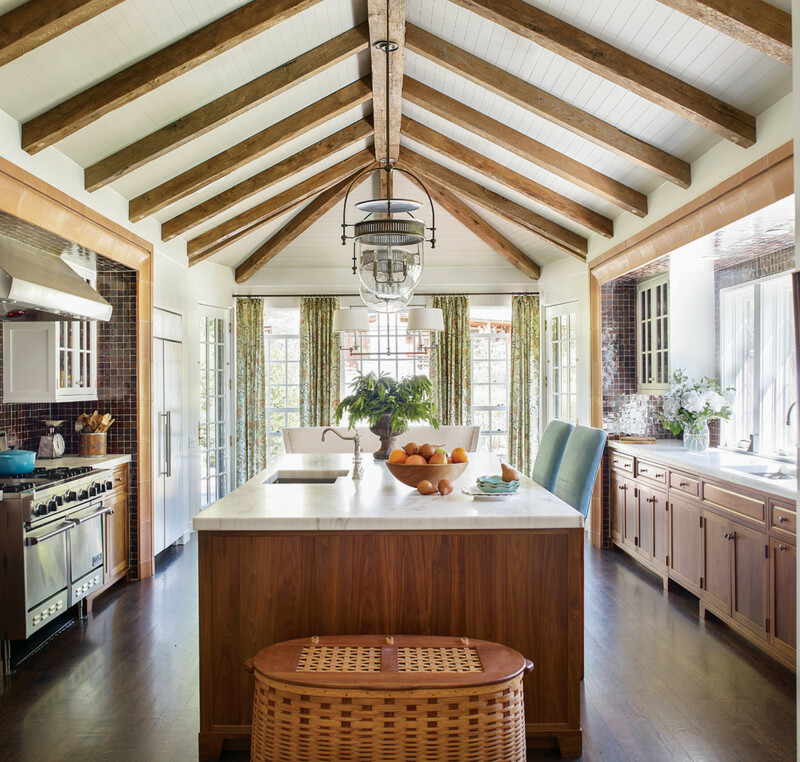 While much of the home is structurally new, its interior style has more akin with tradition than modernity. 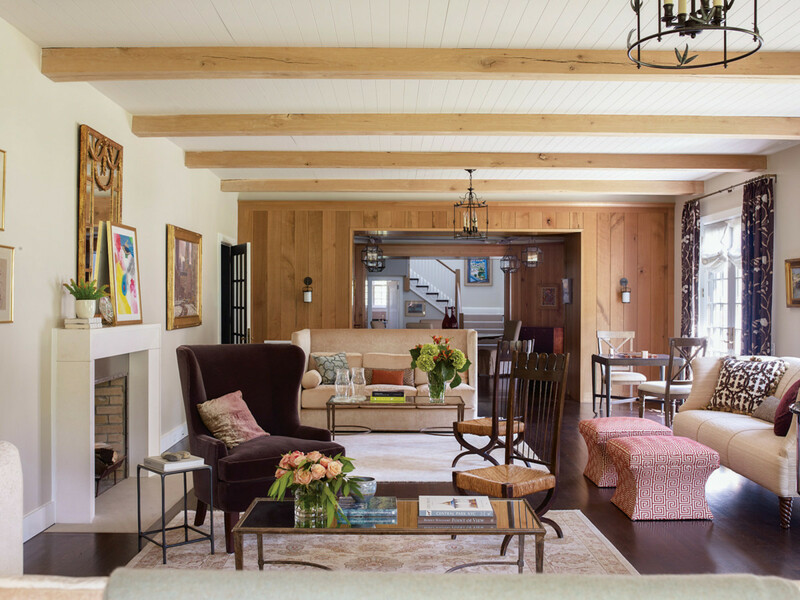 Kligerman and Jung took pains to retain the English Arts & Crafts flavor and also to incorporate many of the homeowners’ furnishings from their previous country house. Some original leaded glass windows remain, new oak timbers are a lighter version of heavier wood detailing that was removed, and other materials, such as the dining room’s lichen-green tile surround and the conservatory’s terracotta floor, bring in a variety of textures evocative of the Arts & Crafts movement. Furthermore, the materials are repeated in different areas of the house, bringing a continuity to the whole. Here and there Jung introduced a contemporary flair. “When Mia added pieces, she stretched me in a little bit more of a modern way,” says the wife. Materials and textures evocative of the Arts & Crafts movement combine with more contemporary elements, like the limestone fireplace, in the living room. Opening up the dark, cramped house to sunlight was a top priority. Where once there was the ominous pipe organ, three sets of French doors allow light to stream in as well as foster an easy indoor/outdoor flow. The conservatory off the living room began life as a two-story music room with no windows. Now its three walls of windows bring in so much natural light that the wife uses it as a painting studio. Above it sits the master bedroom, a space that was added on top of the old living room and which has a cathedral ceiling and a Palladian window. An expansive curtain wall of doors and divided light window gives onto a balcony, the roof of the new conservatory. 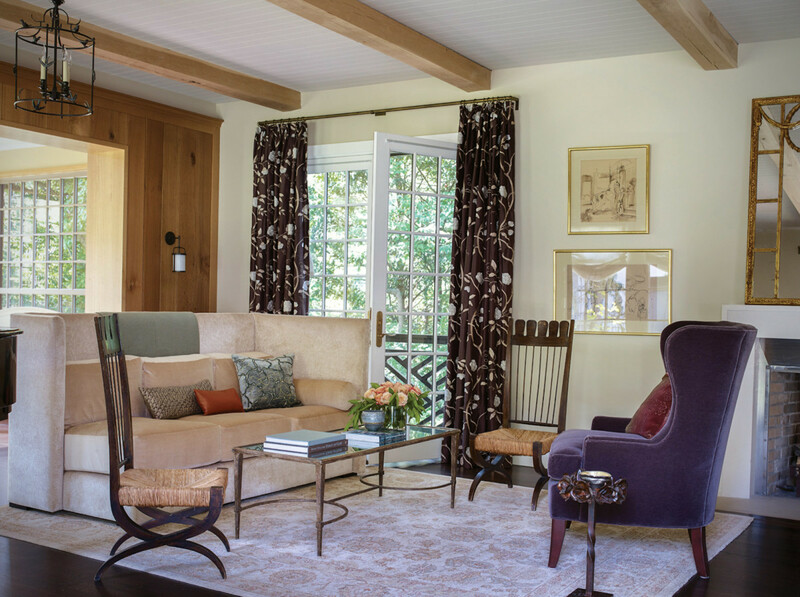 Two circa 1940 Italian armchairs of dyed oak wood and woven river straw add character to a seating area with a custom daybed by Classic Sofa and custom embroidered Shantung silk drapes. Meant to be comfortably snug, the library is painted a dark shade and repurposes cherished furniture from the homeowners’ former house. Skeptical early on to make this octagonal transition space a dining room, the wife couldn’t be happier with how it turned out. “It’s a great space for entertaining, formal dinners, cocktail parties, an informal business meeting, or just reading and eating by the fire,” she says. 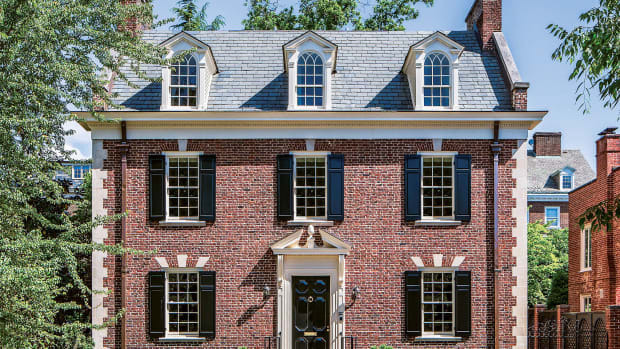 The New Shingled House—Ike Kligerman Barkley takes an in-depth look at this popular American house style.